But the word brindisi may also come from the Italian town of the same name, located on the southeast coast of Italy . This story is connected with ancient Rome. The town of Brindisi then, as now, was a port city. Roman armies embarked on campaigns to make war and conquer more territories from Brindisi. After marching the 476 miles (295 km.) from Rome, the soldiers would revel in the town, drinking and toasting each other for success in battle and a safe return. Italian vintners have reason to make a brindisi these days. Exports of Italian wine have increased by 10 percent over the past few years, and exports of prosecco, the bubbly traditionally used for brindisi, have soared 26 percent to the United States and Canada in the past year alone. So Americans and Canadians should be making more brindisi these days. Prosecco hails from the area around Conigliano-Valdobbiadene, in the Veneto region of Italy nestled near the Alps. The wine enjoys a “geographic indication,” which means that only wine from the region can be called by either of these three names: Prosecco di Conigliano, Prosecco di Valdobbiadene, or Prosecco di Conigliano-Valdobbiadene. In 2008, its status was elevated from D.O.C. (Controlled name origin) to D.O.C.G. wherein the authentic name is guaranteed. It’s a wine with a sharp, fresh aroma and a light taste. 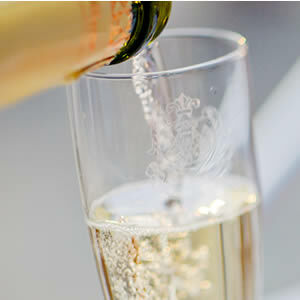 Aged in stainless steel vats instead of in the bottle, prosecco is a wine to drink young as it goes flat with age. That’s all the more reason to make a brindisi. I hope you’ll raise a glass of it soon. Next week, I'll be writing here at Italian Intrigues again. My next post at Novel Adventurers will be April 25. Please check out my new website.